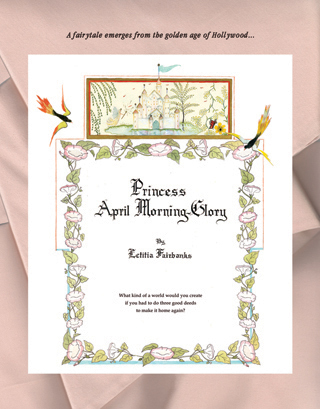 Letitia Fairbanks (yes of THE Fairbanks clan in Hollywood), now deceased, wrote and illustrated the children's book Princess April Morning-Glory almost a century ago. Kelley Smoot Garrett, her step-daughter, found the book 70 years after it was written. In Letitia Fairbanks' honor, Kelley is bringing the works of such a talented lady to life. I am privileged to be able to share in this blog tour. There is an Interview with Kelley Smoot Garrett and also a Guest Post about their family life together. I hope you all read it and enjoy a little piece of history that has been saved and published in our lifetime. Letitia was inspired to create portraiture for the characters of Princess April Morning-Glory from film stars of the day. John Barrymore, and Letitia’s cousin Douglas Fairbanks Jr., provided glamorous inspiration through their then-current films. The Wicked King’s (Barrymore) costume was sparked by his role as Louis XV in Irving Thalberg’s 1938 Marie Antoinette, while the hairstyle resembles his eponymous role in Archie Mayo’s 1931 Svengali. Prince Chivalry was inspired by her cousin’s (Fairbanks) sword-fighting role in David O. Selznick’s 1937 The Prisoner of Zenda. Thank you for this interview, Kelley. 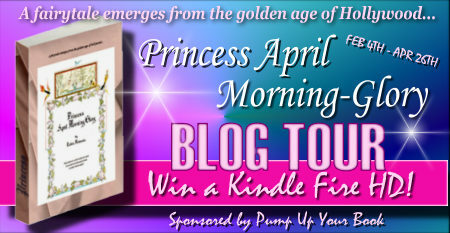 Can you tell us what Princess April Morning-Glory is all about? Kelley: Princess April Morning-Glory is a children’s fairytale about a fairy princess – Princess April, the title character – who leaves the Enchanted Forest to see what is out in the Great World. Once having left her home, she’s instructed by the Wise Wizard that in order to return home, she must first do three good deeds. What can we find inside the book? Kelley: The storyline is the selection of good deeds Princess April chooses to complete and her efforts to evade Fairy Misery – the villain of our tale – who chases after Princess April, seeking to thwart her return to the Enchanted Forest and instead have her do Fairy Misery’s evil bidding. 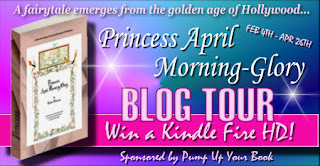 How Princess April overcomes obstacles and performs her good deeds is the crux of the story. Why after 70 years is it now being published? It’s taken that long for technology to be capable of easily and accurately capturing the intricate use of delicate watercolors, along with gold and silver gilt, used in creating the original 49-pages of illustrations. What is the publishing date of release? January 2013, the 72nd anniversary of its original copyright registration. What is your relationship to the late author Letitia Fairbanks and why do you and Amanda Fairbanks feel this is a book that will resonate with book buyers today? Kelley: Princess April Morning-Glory is timeless in its appeal; how can ‘doing the right thing’ ever be out of date? I am Letitia Fairbanks Smoot’s step-daughter, my father Harold (Hal) N. Smoot, married Letitia when I was six years old. As the child who was closest to Dad and Letitia, Letitia selected me to see Princess April Morning-Glory through to publication. Amanda Millner-Fairbanks, Letitia’s granddaughter, was just twelve years old when Letitia died, and has grown up into the journalist and writer that her grandmother would be so proud of. Your press release for the book says “Letitia derived inspiration for the illustrations from then-current Hollywood blockbuster films, as well as deriving her portraiture from a composite of that era’s celluloid legends, along with immediate family members including her mother, father and sister, Lucile.” Are any of these “celluloid legends” still alive and are they in some way participating in the release of the book? Kelley: We are in the final round of negotiations with those celluloid legends and/or their estates and will have announcements regarding that soon. Tell us about the author and her background. How did she fit into the Fairbanks family? Kelley: Letitia was the niece of Douglas Fairbanks Sr. And Mary Pickford, founders of United Artists along with Charlie Chaplin and DW Griffith, at the very beginning of Hollywood in 1919. 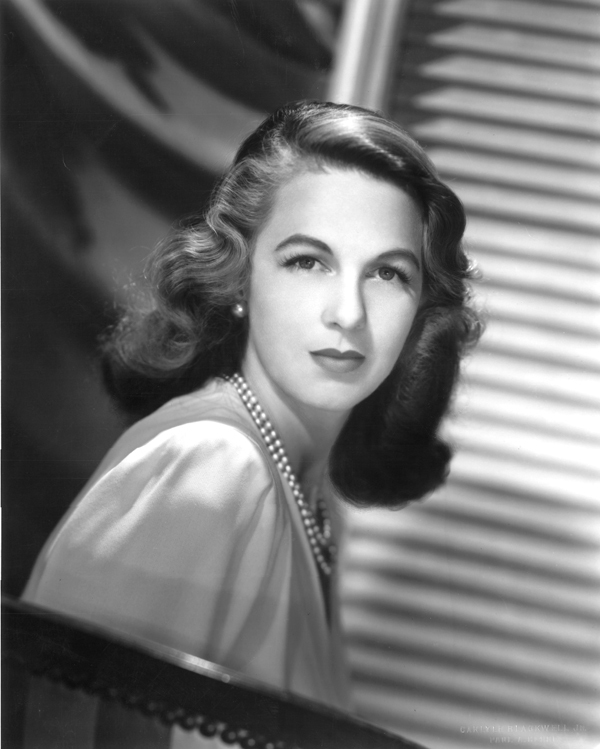 Her cousin was Douglas Fairbanks Jr., family thespian scion, ambassador and naval officer, serving with distinction during WWII. Douglas was made an Honorary Knight Commander of the Order of the British Empire (KBE) in 1949. Douglas Jr.’s grandson, Dominick Fairbanks, continues producting movies in the family tradition, through Fairbanks Productions. Any reason you think why she created a book like she did? Kelley: Letitia envisioned a complete work of art – she painted every two pages, back-to-front on specialty, hand-crafted, 13.5” wide by 16” tall, French watercolor paper, so that the finished artwork is a unique book, at the intersection of art and literature. We have faithfully maintained Letitia’s thoughtful presentation in this initial printing, preserving old-style publishing guidelines, such as never putting text on the reverse of a full page (plate) illustration, and always presenting full plate illustrations on the right side of the open book. Did she often spend time at the famous Beverly Hills mansion called Picfair where her uncle Douglas Fairbanks Sr. and his wife Mary Pickford lived? Kelley: Absolutely! Letitia and her sister Lucile (the inspiration for the title character, Princess April Morning-Glory) were frequent visitors to their aunt and uncle’s mansion, as it was the center of gravity for the entire, extended Fairbanks family. It was at Pickfair that Letitia got to meet and know her cousins – not just Doug Jr. but also Flobelle and Mary Margaret, daughters of the third Fairbanks brother, Jack. What do you want readers of Princess April Morning-Glory to come away with after experiencing this unique and lost book? Kelley: That everyone – not just fairy princesses – creates their destinies by the good deeds they do. Amanda Millner-Fairbanks, a former middle school teacher, and I, in association with special educator Martha Ash, are developing a children’s curriculum around doing three good deeds as part of a daily course of life. Letitia would be extremely pleased if she were remembered by the (re-) introduction into society of treating one another with great dignity and love, through the performance of good deeds on a daily basis. Where can the book be purchased and how much is it and how many pages is it? Kelley: The book can be purchased at Amazon, priced at $23.95. The ebook can be purchased for $7.99 - $9.99. Distribution to brick and mortar stores is in the works. Do you have a dedicated website for the book? 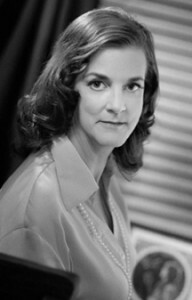 Kelley: Please go to www.PrincessApril.com for more details. Is this a book for kids and adults alike? Why? Kelley: Princess April Morning-Glory is a rare book that works on multiple levels, engaging children in the delightful exploration of the written word through illustrative examples, while interesting adults with larger themes of original Hollywood and detailed watercolor painting technique. For both children and adults, the idea of creating one’s destiny through the good deeds performed can be adopted into our lives, to great effect! My name is Kelley Smoot Garrett and I was Letitia Fairbanks' stepdaughter. My father, Harold (“Hal”) Nibley Smoot, grandson of Senator Reed Smoot (R. Utah, 1903-1933), first met Letitia in about 1938. Fate played a hand in having my father be the stand-in for his sick brother, resulting in his escorting Letitia to a ball in Salt Lake City, where she'd journeyed to be with her maternal grandparents. My father in his Randolf-Macon Academy uniform cut a striking figure at 6'4” and charmed Letitia, seven years his senior. This very pertinent age difference was unknown to me until the late 1980s, after my father died. Only then was Letitia forced to reveal that information, and be traitor to the ingrained Hollywood maxim, “A woman who'd tell her age would tell anything!” due to the persistent inquiries of a hospital admitting nurse, who demanded answers to such impertinent questions. “If only Hal were still were alive! He'd have handled this quietly, and no one would ever have been the wiser, and certainly not the child,” (me.) But discover this, and many other pertinent facts about Letitia's life, was to be my destiny: decoding the mystery creation of “Princess April Morning-Glory” these last 20 years, since Letitia's death. Following my parents' divorce in Dallas in 1963, my father returned to Southern California where he'd previously worked as an oil & gas land man. It proved propitiously timed on several accounts: he was an originator and original participant in Union Oil's dramatic 1966 discovery of the Whittier Field. It also allowed him to meet back up with Letitia. After a year+ long courtship, where my sister Carey and I were brought out to Southern California to meet Letitia during our summer holidays, my Dad proposed, an engagement ring selected, and they were married. Dad & Tish did end up eloping (due to Letitia's mother's continuing objection to anyone her daughter selected as a potential fiancé) and were married in a private ceremony in San Francisco on 25 November 1966. After their return to LA, a reception in their honor was hosted by Letitia's sister Lucile Fairbanks Crump, attended by their cousin Douglas Fairbanks, Jr. and dearly loved family friend and former actress Mary Brian, among others. Letitia (center) with Douglas Jr (right) at my father's and stepmother's wedding reception, Dec. 1966. Man at extreme left with back to camera is believed to be Letitia's brother-in-law Owen Crump. Unknown woman in coral-colored dress next to Letitia. 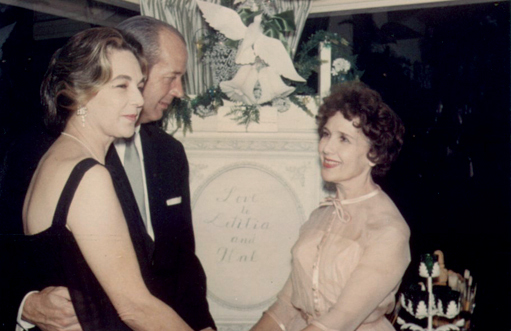 Letitia (l) and my father (c) greeting Mary Brian (r) at their wedding reception, Dec. 1966. 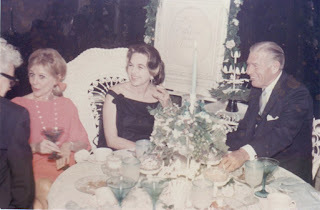 These photos were in my father & stepmother's wedding album, that was always kept in the living room of whatever house they lived in and set the tone for much of Dad & Tish's manner of living: fabulously decorated, elaborate, first-rate cuisine, well-dressed and thoroughly enjoyable. Once they were married, Carey and I stayed in their house in North Hollywood. This was my introduction to the world that created “Princess April Morning-Glory.” On Saturday afternoons the house filled with the sound of music – not much different when I was home with my mother, who primarily raised me and with whom I spent the majority of my childhood & adolescence – but the choice of music! No longer did Mozart & Beethoven fill the air, but the “modern” classical sounds of Erich Wolfgang Korngold and his sweeping orchestral scores were the background music to those holiday visits. Severely damaged in the LA earthquake of 1971, the house was sold and Dad & Tish moved to Dallas in 1972. Letitia often said the day of the earthquake she decided to begin the habit of rising very early in the morning, so she could get more done, earlier in the day. She took the earthquake as personal assurance that sleeping in would be forgiven by the Almighty, as getting up early clearly hadn't worked as anticipated. She was never a morning person from that point onward. And once set free, did that formerly-caged bird sing! The paintings, illustrations and needlework that Letitia created during her years in Dallas are exquisite in detail, and prodigious in quantity while rich in high-quality imagery. Family & friends breathlessly awaited the year's Christmas card from the Smoots: an 8” x 10” glossy photo print mounted on an even larger sized card, and signed by Hal & Letitia. A true Hollywood production, Letitia planned for these cards beginning in July, and as a child and then adolescent, this type of project was something I was always interested in, and would go with her to the photographer's and listen as she discussed how the painting's colors would be better captured if the light were adjusted thus, and the matting and presentation should be altered to a different width, etc. Much of what I learned about art production, I absorbed without being fully conscious from participation in projects with Letitia. My husband has been a marvelous second teacher, re-enforcing the same time-honored principles of classic design & styling, favored by Letitia. In 1982, Dad & Tish moved to Salt Lake City, a place that had been important to both of their families historically, and to which they both had fond memories and family; in short, the perfect retirement setting. And close to good hospitals, as my father had already been diagnosed and treated for lung cancer, although it was prostate cancer of which he would eventually die, in Salt Lake City, 2 November 1988. On the night of the 1st November, Letitia had called me, the first time in our then 22 year shared history she had initiated a call to me; from that alone, I knew my father's end was near. The next morning I caught the 6am flight from Midland, TX to SLC; A taxi took me from the airport to their house on East 2nd Street. The driver had already pulled away when I realized that no one was home, so I stowed my bag on the back porch, and ran till I was too tired, then walked as quickly as possible up the hill to the hospital. The scene that greeted me was something out of a Hollywood movie: my stepmother was crying – marking the 2nd time in less than 24 hours, another event had occurred for the first time in my life. My father was not conscious but clearly not comfortable, and a nurse trying to figure out what to say or do next. Letitia looked up and exclaimed, “Oh, you are just like General Custer and his cavalry, riding to my rescue!” I thought, “Where in the world did that image come from?” In 2009 when I watched “They Died With Their Boots On” I was reminded of this episode. Another clue fell into place. Letitia spent the next four years of her life in Salt Lake City, making a final visit to Southern California, to see her son Robert, his wife Judy, and her beloved grandchildren Bryan and Amanda one last time. I was living and working in Singapore and received news there that Letitia had died the day before. I had spoken to her last about 2 weeks before her death. She was lucid but tired, as always concerned for her son Robert, and her grandchildren. We talked at length about how things that cannot be changed must be accepted, and how she felt that always lead to growth – a requisite for life. She painted until her death. 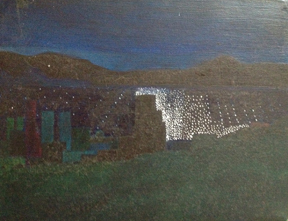 This is her last painting, found on the easel in her back-porch studio that overlooked the valley: an oil on canvas, not quite finished, still with room for growth. AWESOME!! How great it is that Kelley could publish this book 70 years after it was written. Tell me what you think. Today... I picked something up for someone to surprise them with just because I thought they might like it and expected nothing in return.